The Low Down: Cricket Thompson is almost closer to her best friend’s family than her own. Unfortunately, ever since her parents divorced, her mother doesn’t leave the house much and has become depressed. She even keeps a framed photo of her ex-husband in her bedside table drawer, even though he has moved on. Cricket’s dad has remarried, and his new wife came with a child. There’s nothing Cricket would rather do than to forget her sorrows and concentrate on the things she loves: her best friend, Jules; lacrosse; and her soon-to-turn-into-more-than-just-a-crush, Jay. The Claytons summer in Nantucket every year, and Cricket yearns for the chance to experience life on the island: working a part-time job, hanging out at the beach, and getting to spend the summer with Jules. Then, amazingly, for the first time, Jules’ family has asked her to join them. Of course, Cricket is beyond excited; for not only will she get to spend time with Jules, but Jay as well, since his family goes there every summer, too. This will be the best summer of her life. Then, horribly, Mrs. Clayton dies suddenly, and the family decides to travel to Nantucket alone. Feeling that her friend needs her, Cricket finds work on the island and a place to live to tries and be there for her friend. While Cricket understands Jules’ reticence and the family’s wish to grieve alone, she can’t make sense of the anger and distance that Jules has tossed between them like a grenade. Then love blooms in the most unexpected way, leaving Cricket to make some big decisions, including whether others’ opinions of her are more important than her happiness. And, surprisingly, through all of her self-discovery, she learns a lot about someone she had written off – her mother. Best Thang ‘Bout It: I love a good summer romance set in the northeast. Maybe it’s because I am a Texan, born and raised, but traveling to Boston or the Cape is like stepping back in time to a different era. The accents, the clothing, the old homes; the ocean with sailboats or tallships; the salt air, the history; they all scream old-school charm. So, reading a book set there? I love it. This romance has a lot of depth and is more than just a boy-meets-girl tale. The secondary characters are very well-developed and three-dimensional. There’s, of course, Jules’ family and Jay and his friends; but also Gavin, Cricket’s boss; Liz, who works with Cricket; and George, the writer she helps. Even people who appear in one or two paragraphs are sharp and vivid, making me feel like I am there. Shouldn’t all books do that? Sometimes drama is thrown in when the plot has stalled, or to be the BIG TURNING POINT/LESSON TO BE LEARNED STATED HERE. I have read many a book that uses these tricks to the extreme, either drawing something out until you want to just skip the pages altogether or making the book frustrating to enjoy. Many times this melodrama is telegraphed way ahead so you know what’s going to happen, and it’s not going to be good. Yes, a book needs drama (also known as PLOT), but when it doesn’t ring true, for shame. I never felt this way, especially when SOMETHING happens that I shan’t disclose here. Yes, there are some lessons to be learned, but they aren’t contrived or trivial. The book isn’t heavy, but it is realistic. I’m Cranky Because: I didn’t want to have to take the ferry back to the mainland so soon. The Bottom Line: Read this before fall. Then, read it again in the dead of winter so you remember the promise of summer. 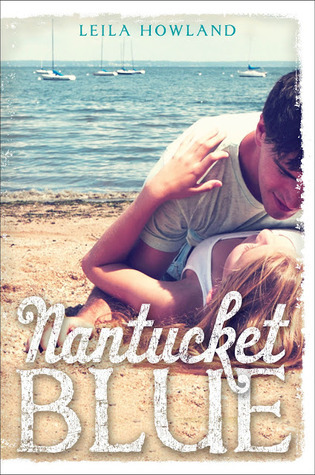 Nantucket Blue by Leila Howland was published May 7, 2013 by Disney Hyperion. Ink and Page picked this book up from the library, so no one had a choice about whether it was reviewed.